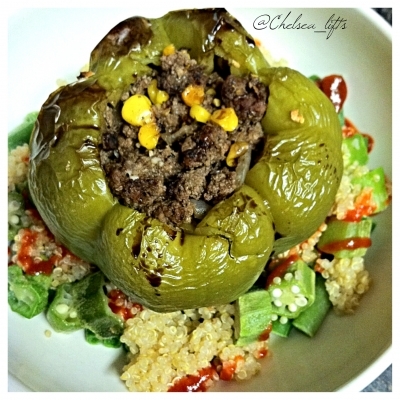 Baked Green Bell Pepper stuffed with ground beef, onion, rice, tomato, and corn served over a spicy quinoa salad with okra and Sriracha hot sauce. In a skillet saute diced onion and garlic in 1/2 tbsp of olive oil. Add in 1lb of extra lean ground beef and brown the beef. Once browned, turn off stovetop, drain off excess grease and add in 1/2 can of corn, 1 whole roma tomato, and spices (pepper, chili powder). Mix and then set aside. Preheat your oven to 350F. Take two green bell peppers and cut off the top of them and then core the middle. Add in meat mixture. Cook in the oven for about 30 minutes, checking every 5-10 minutes to see how done it is along with basting the pepper and inside with a little bit of water to ensure that the meat does not dry out. While the peppers are cooking, cook your Quinoa per instructions on the box/bag - make 1/2 cup dry. Once Quinoa is cooked stir in okra. To assemble, put Quinoa salad in the bottom of the bowl, drizzle with siracha, and then place the cooked pepper on top.